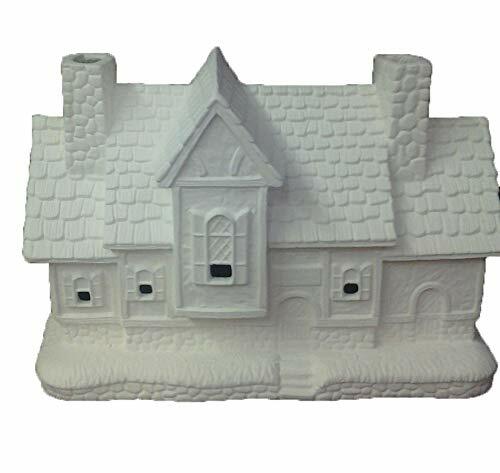 Ceramic villages are widely used to depict the old-fashioned, small town way of life at Christmas time. Buying ready made villages can be very expensive, but painting your own means saving a bundle of money, while making wonderful memories in the process. Colorful and cute, mini-towns with houses, businesses, and a church with a steeple represent a more relaxed time. Carolers gathered in the town center and families skating on a nearby pond will add a quaintness to the scene. Put some children sledding on a big hill (created by putting crumple paper under the cotton batting), trees covered in snow, and then light it all up for a display the family will enjoy throughout the holiday season. Adding accessories to the finished project can be just as much fun as your village grows and expands each year. On this page I share pictures from the village my family painted years ago. Create a unique little town for the Christmas holiday season. It's understandable that people can't fit one more thing into their already busy days. And then comes holiday time! Like many, I start to panic at the thought of new projects that will have to be stuffed into my 24 hour day. How many more hours of sleep can I possibly cut down on? But I always say, if I want it bad enough, I will make a way. It's true that back when I decided to build my own Christmas Village I had kids to help me. It was a lot of fun having my daughter paint the "barn house" and even my not-so-crafty son chose a piece to paint. (I think he gave up and I had to finish it.) Deciding on the colorful combinations for the houses was great fun, and seeing how they all looked perfect together as a village, gave us all satisfaction. We had created a little pretend town! One thing I pointed out to my kids was that our Christmas village was like no other. It is totally unique. Each year when I unpack the box and set it up, my kids still love to reminisce and recall the fun we had. I'm so glad we did it. This is one of the houses I painted. The old car is part of the mold. The lumps of snow on the roof were also part of the mold. A little sparkle glitter adds interest to the fake snow. Add something new to your village each year. This one is called "Santa's Castle". Add the date to the bottom when you've finished painting. 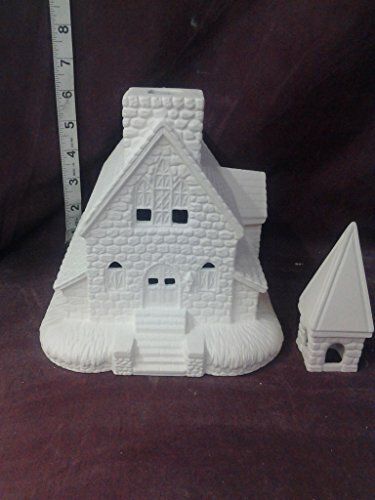 One of the most well known companies that sell beautiful Christmas village pieces is Deptartment 56. They offer a wide range of very nice pieces for creating a special display for the holidays. 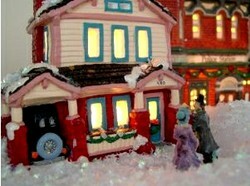 Their sets include themes like the New England Village, Williamsburg Village, North Pole Village and more. And each building will cost about $80 and up! I have a toy store ceramic piece (pictured) and painted it myself many years ago. I chose colorful blue, pink, purple and yellow to create a bright "toy store". My house cost far less than $89.00, and no one else will have one like it! If you and your family like to do crafts, begin painting little houses any time of year to be sure you are ready for set up at holiday time. 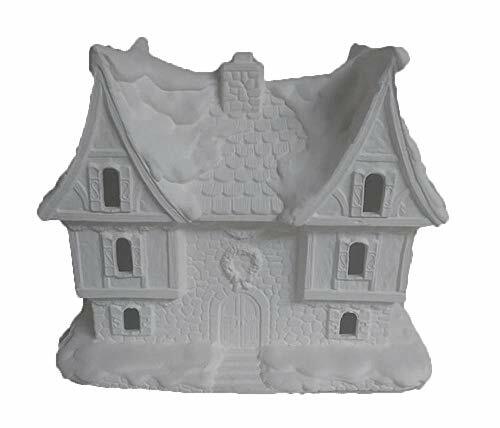 These plaster houses, sold by Kreative Creations Ceramics can be purchased on Amazon. They are affordable and seem to be well made. Also they are made in the USA, and not China. 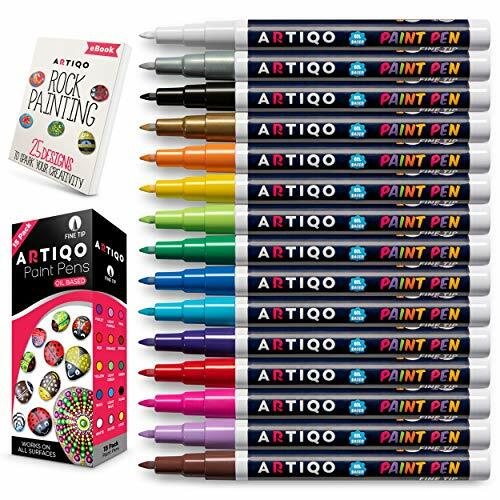 Buy paints separately in any colors you like. Add sparkling snow (glitter) and arrange to display with lights underneath. Each little ceramic bisque mold is shown with measurements. Figure out how much space is needed to create the village of your dreams, than choose your favorite pieces to paint. The attention to detail in these molds is quite nice and once painted will look realistic. Comes in two pieces. Glue the steeple to the top after painting. Mayco Church 12" x 7" x 7"
Add trees, light posts, tiny people, and a little skating pond for interest. Once the pieces are painted it's time to decide how to display them. My set includes a few homes, a toy store, a church, a police station, bank, trees, light posts, little people, snow, and a glass skating pond (pictured). I have a long table that gets cleared of it's framed photos and table lamp for the holiday season. It's the perfect place to set up my village. A short strand of bulbs winds around beneath a piece of cotton batting where I've cut holes to poke the bulbs through. Each house is set on top of one of those bulbs. It's easier than having one light for each building. Every year the town takes on a different look, and for a while I was adding new items to the scenery each year. Most of my additions were cheap items from the dollar store. After placing the little people on the pond (a small mirror), and arranging the trees and other figures, like the manger scene by the church, I sprinkle the whole town with "snow" to cover overlapping of the cloth and the edges of the "pond". When it's time to clean up, I roll up the batting to catch all of the "snow". Mayco Inn 6" x 9" x 4"
Read carefully the size of the items. This may go without saying, but when ordering online be sure to buy accessories that will be to scale according to the size of your houses. Oversized people and trees will look unrealistic next to small structures. Adding extras to make the scene come alive is just as important as setting up the larger plaster pieces. If you choose to buy the paint-your-own houses shown on this page, they are four inches in size (approximately). Buy trees, people and wildlife that won't look out of place next to the buildings. 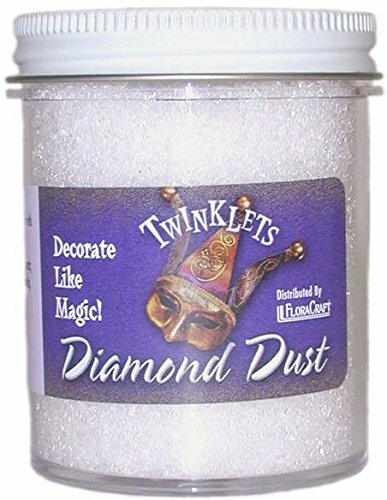 Diamond dust adds sparkle to snow-covered rooftops. More considerations when buying 'ready to paint' houses. 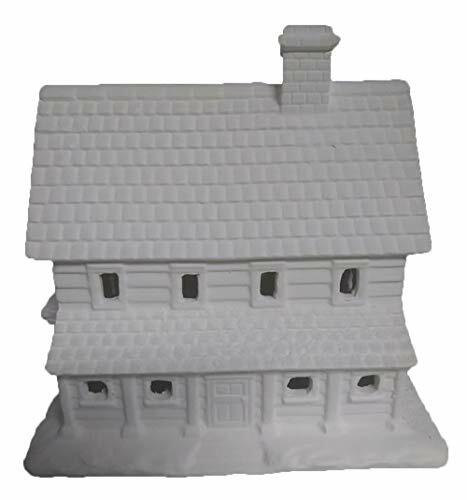 Besides price, it's important to remember that all the unpainted houses should be the same general scale - sized to fit together and look natural. It's easiest to find villages and buildings that are already painted, and they will be pricey. When searching at sites like e-Bay include the search words "plaster" "unpainted" "paint your own" and "ceramic". Consider buying buildings that have open windows. They will glow from the inside when your lights are added. If you don't plan to use lights, then it won't matter. Your local dollar store and any craft store are good places to shop. Keep your eyes open for little people and other decor to add to the scene. My manger scene characters were miniature tree ornaments. I removed the hanger and they became characters in my winter scene. 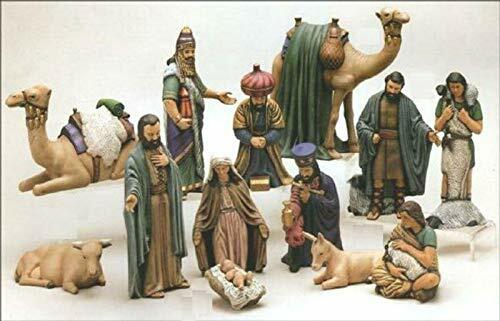 Unpainted set includes 15 pieces with wise men, baby Jesus, camels and animals for a manger scene. Duncan 15piece Ceramic Nativity 7" to 9"
Tips for adding inexpensive items to the display. Children building a snowman figurine is small enough to work in your village. For those of us on a tight budget, begin with just a few pieces and gradually add to the display year by year. Search for after Christmas sales, at your local stores and online. Check yard sales throughout the year, as some of the things you can use for the town are not necessarily "Christmas" items. Doll house items may work well for your village design, and some everyday items can be used as fun additions, with just a bit of imagination. For instance, if you don't have any trees for your town, get branches from out in the yard and stick them into clay holders. Glue snow flakes to the branches and you have some realistic looking and totally free trees! The kids can probably come up with some good ideas, as they tend to be crafty. Search on Amazon for Lemax accessories as they are less expensive than Department 56 and other big name brands. Find people, like the ones building a snowman shown here. The Our Snowman Christmas Village Figurine measures 2.68 inches and can be found at Amazon. Tell us about your Christmas village. It's such a worthwhile craft that can be added to each year. I'm glad I did this with my kids while they were young enough to enjoy it, and now they love to see it all set up. What a great idea to keep everybody busy. Awesome! It's so much fun to pick your own colors and create a little cottage or store. I don't know how to paint either, but the fun is that you don't have to be very talented to make a little village. If you don't like the end product, just paint over it! I love to paint, but I don't do it these days (I don't really know how to; I just love the colors). Wonder why not. I would love to paint these houses, and it would be a good exercise for kids, too. Hey, you are always thinking aren't you? Thanks for the input. No I don't set up a holiday village. But this article presents an excellent work at home, home-based business opportunity. What a great idea! No, I set up a nativity set, but if I had the room I'd love to have one of these villages. They are so cute. I think you've included everything in this article you'd need to know about ordering one of these. The unique Christmas ornaments and figurine collectables created by Patience Brewster add whimsy to holiday decorating.